The use of the best technologies capable of exploiting renewable sources is subordinate, for SassoErminia, to all those energy efficiency choices capable, first of all, of reducing consumption. In this direction go, the construction of the new portion of the house in wood and straw, a real passive house with a consumption of 8 kWh / m² and without the need for a heating and air conditioning system, the use of LED lights for indoor and outdoor areas of the structure, the choice of a radiant floor system with low consumption for the structure in stone and stone powered by heat pumps (assimilated to renewable sources) whose energy is produced by photovoltaic panels made by the Ubisol Group. 1 – SassoErminia is not connected to the natural gas distribution network. We have chosen to use only electrical energy both for the production of DHW, and for heating the rooms using for both a high-efficiency Rotex heat pump, both for the induction cookers of the two kitchens, and of course for lighting. The electricity is also produced by a photovoltaic system with a power of 4.68KWp (18 BENQ 260W modules and Fronius Symo inverter). 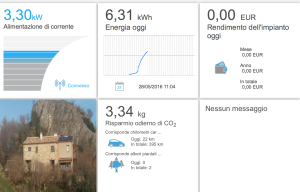 2 – A system for monitoring the production of energy by means of a Datalogging card is also active, allowing the quantity of energy produced by photovoltaic panels and that ‘absorbed’ by domestic consumption to be recorded remotely. (Fronius Smart Meter 63A-3 system). This development makes it possible to use the Heat Pump as a substantial energy accumulator, i.e. to produce hot water in storage at a higher level only when the difference between the energy produced by the photovoltaic system and that absorbed by the consumption of the structure is a positive sum, further reducing the energy required from the electricity grid.